Is that an awful pun? Most likely. If you didn’t hear what Aaron Forsythe had to say, check it out here. Modern Mastery is a stand alone set with 229 cards (same as M13 without basic lands). The set is not Standard legal, and the cards are only legal in the formats they would be legal in (Modern/Legacy/Vintage/Commander). All of the cards are reprints (no new cards), and will only be select reprints from 8th Edition to Alara Reborn. $6.99 MSRP, 24 boosters per a box. If you notice, the 24 boosters are great for an 8-man draft which this set was designed for. Oh, and there’s no Basic Land. That spot in the back is being occupied by a foil card. Yes, a foil card in every pack. Plus, paper tokens that had never been seen as tokens before. And we know what card already: Mythic Rare – Tarmogoyf. Seriously. So, what does all of this mean? There’s a lot of things going on here. Let’s break it down. 1. WotC believes in Modern. One of the main reasons why Modern was created was to give people a non-rotating format for people to play where the Reserved List wasn’t involved. Everyone I know at WotC hastes the Reserved List, but it’s not going anywhere. Instead, they created a format that could last where they could reprint any time. WotC has said this from the beginning. If your players don’t have the cards to play in a format, they aren’t going to play it. There’s two ways you can combat this: A), reprint the cards that are in high demand giving more people access to them or B) print more powerful cards in newer sets that invalidate the older cards. When you take option B’s path, you create an issue that’s like in other CCG’s: Those that have the money for the most up to date decks tend to do better. It isn’t about skill any more, but just constantly acquiring new cards (while some might say that’s true with Magic, the lower level of “bad” cards have risen to be better than in the beginning of the game’s history). The Shocklands were reprinted, something that players were crying out for to get more people into Modern. This is the next step by getting older cards into player’s hands without screwing up Standard or other formats. WotC knows the power levels of these cards so none of this will be a surprise. If they didn’t care about the format, they wouldn’t have invested the time in this product (Where do you see the Extended support? Oh Extended, I remember when you were fun). 2. The distribution model is excellent. People have been complaining that the From the Vault series should have more powerful cards in them because they mistakenly believed that there would be enough product to go around to get more cards into other’s hands. The From the Vault series doesn’t produce enough to seriously alter the availability. This is the same with the upcoming Commander’s Arsenal (which is another issue that people have). With this being a hopefully wider release, it will be able to get more cards into the people who want to play Modern than just collect the From the Vault sets. Also, they designed the set to draft. There was time and energy spent on making this a valid limited format. 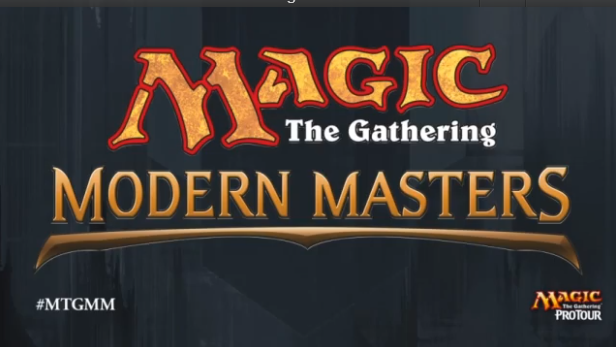 They’re even basing a Grand Prix event on Modern Masters Limited. Even if it was for one event, you couldn’t imagine that WotC wouldn’t take this into consideration. Add in the fact that you’ll be able to draft this on Magic Online (where people draft the hell out of a set), and you have to focus on throwing just good cards in there. If this was a set not sold in booster packs or as a complete set (think a Redemption Set like with Magic Online), image how expensive that product would have to be. No one would pay that price. 3. Knowing your audience. The people who should be buying these sets are people interested in Modern or people who love drafting. Modern Masters isn’t a set for new players to get their hands on just like the Commander’s Arsenal isn’t for people who don’t like foils and are just starting out in Commander. The $7 MSRP price tag should scare newer players away but entice those that want/need these cards. With the price being higher, they can look at the secondary market and put in better cards because it will be more expensive (unless those foils really add up). Since WotC has all of this data of what the top decks are, what everyone is asking for them to reprint, it’s easy to get a wish list going. Will everything everyone wants be in here? Most likely not. But I do foresee plenty of really good cards and make it worth the while most of the time. I do have one worry. This is a time where limited fans will be drafting RTR block in its full for a month while having M14 a month later. Is this too much for limited formats? I don’t know; I guess we will find out. It’s being released at the same time the normal multi-player summer set would, but it might be still too early to see if this will replace it for this year (With the Commander Decks being moved to November, it might be). No word as of yet. As for speculation of what goes in here, it’s quite a bit easier to find out what works and what doesn’t work (And makes speculation a bit easier since there’s more cards in here to work around while having the known possible cards as well). This seems like a fun exercise to do in the future. Even though I have a majority of the Modern staples in my collection, I fully support this set. It’s a fantastic way to have players unable to join in the fun of the format while keeping a majority of the value of the cards intact. You can’t give the cards away or people will stop playing the format. You can’t have $100 cards, you can certainly help lower the barrier to entry at the same time getting more people to play. No one will play if they can’t find anyone to play against. While this set will have some awesome cards, expect some clunkers as well. This isn’t going to be all upside here (but expect more than usual), but not every pack you crack will be a foil Tarmogoyf. I’m excited to see what will eventually come out of this set and the effect it have on the growth of the format itself.